Tourism Minister Alexandria Otway–Noel said that research conducted to determine the status of the Mona Monkey in Grenada has revealed that the population is significantly reduced in the wild, and the species may soon be declared endangered. “One of the reasons for the reduction is the fact that hunters continue to hunt them outside of the hunting season, not just in the allowed hunting areas, but also in the National Parks areas where hunting is prohibited year round,” Otway–Noel told the House during Friday’s sitting of the House of Representatives. “Some of these hunters are killing the mothers and fathers and then selling the babies as pets,” she said. “If this continues, sooner or later there will not be monkeys as part of our wildlife. People therefore have to obey the law and allow for the monkeys to mature, so that the population will grow” she told the Parliamentarians. Using the Grand Etang Hospitality Centre as an example where the reduced population is observed, she said that previously, more than 20 monkeys would be seen in or around the Centre’s compound on any given day, but nowadays only 3 monkeys would come to interact with visitors. The Grand Etang Hospitality Centre is one of the attractions within the rainforest of Grenada. Visitors are allowed to feed and take photographs with monkeys on the Centre Compound as memories of the visit. The research into the population of the monkeys was conducted by two French researchers. 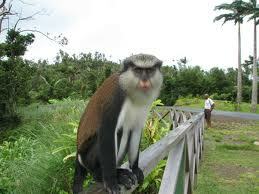 The Mona Monkey is an Old World monkey that lives throughout Western Africa. The mona monkey can also be found on the island of Grenada as it was transported to the island aboard slave ships headed to the New World during the 18th century. Grenada, since the passage of Hurricane Ivan, adopted stronger measures to protect its wildlife that are under threat by allowing a shorter hunting season, while wildlife delicacies are banned from being served at restaurants during the closed season. The challenge for the Department of Forestry is continuously monitoring the forest to ensure that wildlife is not exploited by hunters for their own consumption during the closed season.